Chelsea bounced back from their EFL Cup semi-final defeat to book an FA Cup fifth-round spot by beating Newcastle United 3-0 at home. Michy Batshuayi celebrates scoring Chelsea's opening goal on Sunday. 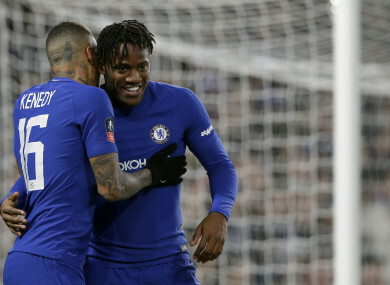 MICHY BATSHUAYI STRUCK a first-half brace as Chelsea cruised into the fifth round of the FA Cup with a comfortable 3-0 victory over a lacklustre Newcastle United at Stamford Bridge on Sunday. The striker is rumoured to be heading out on loan ahead of Wednesday’s transfer deadline but demonstrated his goalscoring ability with a double to help the Blues bounce back from their midweek EFL Cup semi-final disappointment against Arsenal. Antonio Conte has been linked with a string of strikers, including Edin Dzeko, Andy Carroll and Ashley Barnes, in a bid to add back-up for Alvaro Morata, but on this evidence the answer may lie closer to home. Chelsea took the lead after a low-tempo opening half-hour, Eden Hazard and Marcos Alonso combining to tee up Batshuayi after Pedro’s long pass opened Newcastle up. Batshuayi recorded his 10th goal of the season in all competitions shortly before the break, Jamaal Lascelles’ attempted block from the Belgian’s shot looping the ball over goalkeeper Karl Darlow and in. Alonso’s sublime 25-yard free-kick wrapped up the victory and Chelsea’s unbeaten run at home stretches to 15 matches, while Newcastle’s appalling FA Cup record continues, with the Magpies last reaching the fifth round in 2006. Gary Cahill’s mistimed header from a Hazard corner was the only attacking incident of a poor opening 20 minutes, with Dwight Gayle having failed in an early attempt to win a penalty. Massadio Haidara, making his first start of the season at left-back, beat Davide Zappacosta and delivered a fine cross for Jonjo Shelvey, but the midfielder’s volleyed effort was easily turned around the post by Willy Caballero. Chelsea had barely threatened but the Premier League champions broke the deadlock in the 31st minute. Pedro’s long ball was perfectly weighted for Hazard to wait for Alonso’s run and the wing-back slid the ball into the path of Batshuayi to slot home into the gaping goal. Antonio Rudiger almost curled in a sensational strike, the defender seeing his shot fade wide of the far post after collecting a cross-field Hazard pass and cutting inside off the right flank. Pedro and Hazard combined again for Chelsea’s second in the 44th minute, the Belgian freeing compatriot Batshuayi for a powerful low strike that looped over the unfortunate Darlow after taking a big deflection off Lascelles. Caballero made saves from Shelvey and Chancel Mbemba on the brink of half-time to protect the Blues’ two-goal lead and Pedro fired narrowly over the crossbar shortly after the restart. Darlow made a tremendous save to keep out Alonso’s deflected volley but the goalkeeper was left helpless from the defender’s free-kick in the 72nd minute. Alonso has carved out a reputation as one of the Premier League’s finest set-piece takers and his seventh goal of the season in all competitions was a beauty, a 25-yard curler that bent out of Darlow’s reach. Although Darlow twice denied Batshuayi his hat-trick, a three-goal lead allowed Conte to introduce Ross Barkley for his home debut while youngsters Ethan Ampadu and debutant Callum Hudson-Odoi were given cameos, but the Italian will likely want further squad additions before the closure of the transfer window. Email “Batshuayi brace books fifth-round FA Cup spot for Conte's Blues”. Feedback on “Batshuayi brace books fifth-round FA Cup spot for Conte's Blues”.